Try purple gnocchi. Rich and flavoursome. After years of searching the globe, we have finally found a bold challenger to the renowned orange-fleshed varieties. 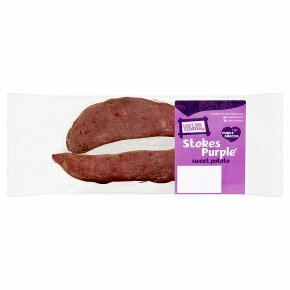 The Stokes Purple® Sweet Potato packs a full flavour and a smooth texture. Whether you're mashing, smashing or baking, it's time to get creating with this special spud. Wash before use. Feeling Adventurous? Try mashing your cooked sweet potatoes and mix together with one beaten egg to make your gnocchi dish really stand out. Cooking appliances vary, check that food is piping hot.Roast: 30-45 mins.Preheat oven, Electric 220°C, Fan 200°C, Gas Mark 7.Peel, dice and place in a pan of boiling water. Cover pan and bring back to the boil. Reduce the heat and simmer for 10 minutes or until softened.Transfer to a roasting tray and toss with oil and seasoning.Place on the middle shelf of the oven for 20-30 minutes until crispy. Turn occasionally.